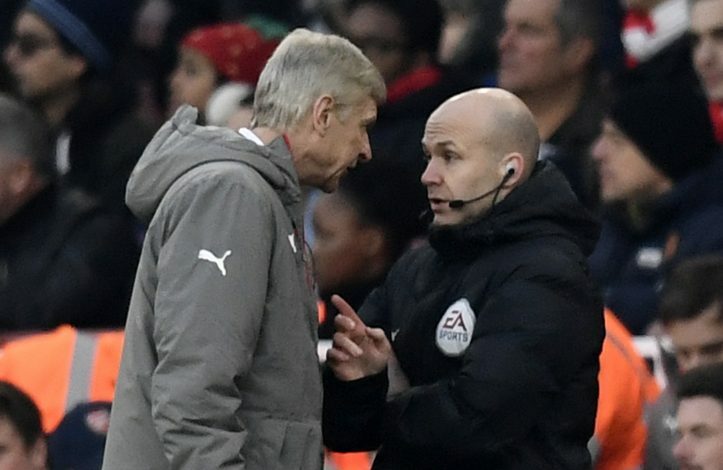 After incidents of Wenger calling ref Jon Moss a “f***ing cheat” and shoving fourth official Anthony Taylor, the Arsenal boss could be facing match bans after being hit with two charges of misconduct. The FA has charged him with these allegations after incidents of his side’s 2-1 Burnley win, and a ban could imply him missing Arsenal’s all important crunch clash with Chelsea next month. Earlier punishments were a two match touchline ban and a £20,000 fine for his behaviour, but as per reports in The Sun, he could now be facing a stadium ban which would prevent him from having any contact with his players. After being sent to the stands by Taylor, Wenger not only opposed, but also clearly shoved the fourth official from the tunnel while disobeying given orders. The Frenchman also used curse language towards Jon Moss, according to the ref’s match report. In 2014, Rui Faria, then Chelsea assistant manager, was handed a six match stadium ban for the same insult which was reduced to four games after appeals. Wenger has not been charged by the FA since 2010, and the association will look into the manager’s previous year records before taking further action. Adding further blow to injured wounds, Xhaka, who received his second red card of the season against Burnley, is also out for four games, and will miss the Chelsea clash. Arsenal do have an option of appealing against it, but are currently not doing so.